A recent episode with the Chipper LLC Tree Service painfully reminded me of 4 important customer service principles that should be embodied by every business, including your voiceover business. First, though, I’ve give you a brief synopsis of the situation. rose high above the roofline on the left side of my house. One of the Bradford pear trees in my front yard had a dead branch that needed to be removed, so we called a tree company based on their positive reviews we saw online. We decided that we’d also like to have the highest limbs of the trees trimmed down; they had never been pruned, were extremely tall, and overhung the roof. These trees are 15-20 years old and very well-established, but the limbs can become brittle and break in an Atlanta snowstorm. 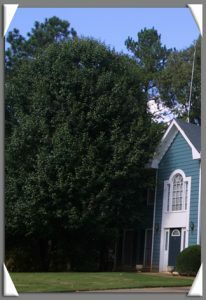 In our minds, this description meant that the overall height would be reduced in line with the top of the roofline (i.e., “just top out a little higher than the gutters”) and some limbs trimmed to give each tree a smaller shape, just as we had requested. We were completely horrified to discover that the crew who came back the next week to perform the work butchered our stately trees down to leafless sticks! only with no limbs or leaves to provide shade in this sultry Atlanta summer. Naturally, we were quite upset that A) our beautiful trees were demolished, and B) the work was not done to our specifications. The trees not only look terrible, but we’re concerned that they may have incurred irreparable damage and would need to be removed. Since the work was performed on one of the hottest, 95-degree July days, the trees could have endured a shock from which they may not recover. 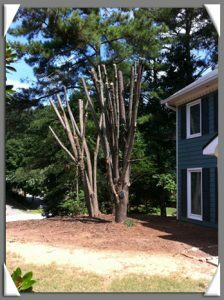 We called the owner of the tree service to ask for the remedy of removal of our trees at no additional cost to us. As calmly as possible, I explained that the “trimming” was far more extensive and destructive than we ever imagined it could be. We had never planned or wanted to remove the trees, but now we thought we would be forced into that action. In addition, the trees were now an eyesore to us and all residents in the 200+ houses in our subdivision since all of them must pass my house every time they enter or leave. Finally, I stated that we have a very active neighborhood email list in which homeowners are constantly requesting referrals for various services. Here comes the part where voice talent and other business owners can learn how NOT to run your business! The owner said he had told his estimator countless times that the estimator needed to explain to a customer how Bradford pears would look when they are ‘topped out”. In fact, he continued, they had a page on their web site that showed customers what to expect, not that anyone had pointed it out to us. When I finally saw that page, I learned that the phrase “top out” has a very special connotation to the tree cutter holding the chainsaw — cut off everything! We learned too late that “topping out” is actually a last-resort measure to save trees before you remove them. Okay, BUT….we never intended for our trees to be “topped out”! How were we supposed to know the common phrase meant something very specific to them? Obviously, if the owner has had this conversation more than once with the estimator, the company has an existing communications problem. He flatly stated it would cost an additional $300 for them to come back out and remove the trees. The call quickly turned ugly, making my attempts to find an acceptable compromise futile. The guy completely insulted me with his terrible attitude. He was arrogant, angry, and abusive; I should have hung up on him. He rudely demanded that Drew “needed to own up, be a man, admit that he lied [to me], and call the estimator a liar.” If Drew did all of those things, they would come back for $200. It would a loss to him if he had to send a crew back to my house without pay. He then made a comment about not wanting to take the customer’s word over that of his estimator! My problem with the trees is unresolved, but I wanted to tell you this story today so you’ll keep these 4 tips in mind as you solve problems for your voiceover clients. 1. Communicate clearly and agree on expectations at the outset of the project. The tree service owner had encountered my exact situation so many times that he had a web page devoted to the subject. The estimator should have shown that page to Drew and asked, ‘is this the level of work you expect?”. By the same token, I want to ensure that the client and I both are using the same terms and have the same idea for the kind of audio that the client will receive. On those rare times when someone asks me for “raw” audio, they still want audio that is edited so that it is free of mistakes and re-takes. As another example, I have had clients asking for 8 kHz, 8-bit mono files for their telephone systems. Before sending the final recordings to them, I prepare them at the project outset by giving them a sample of that kind of file. They need to know that it won’t sound like a CD; it may not even sound good due to the hisses and buzzes that are inherent in such low resolution files. 2. Only take an irreversible action with your client’s full understanding and consent. The tree company crew chief had a second chance to show Drew the web page before they ever made the first cut. He also could have checked in with Drew periodically as the work progressed to ensure that they trimmed the trees to match our vision. In voiceover, you have to protect the raw audio that you have recorded. If you delete a section and then save the file, that section could be gone forever depending on your software. One reason that I like Pro Tools is because of its non-destructive editing features. It actually creates a new file with every change, and effects are not applied to the original file. I could change or remove the compression or any other effect, bounce the file again, and have a new file as output — all while keeping the original recording intact. If your software doesn’t offer this functionality, it’s a good idea to save your original recording to a different name before you do any editing. 3. Expect that you won’t make money on every transaction. While the overall goal of a business is to make a profit, you shouldn’t expect to make money on every single transaction. The goal of each transaction is to pursue cement a harmonious relationship. The tree service owner didn’t want to come back to fix the mess his crew made unless we paid for it. He caused a problem for me, so I shouldn’t have to pay more for him resolve it. He should realize that he is actually going to lose a lot of money based on my negative reviews of his company to anyone who will listen! In contrast, I offer unlimited free re-recordings if I have made an error in pronunciation or inflection if my client notifies me of the errors within a week of receiving the audio. I also outline my policy about charges for script revisions before accepting the project. However, in many cases, the client only needs something simple, like a sentence changed. Whenever possible, I am happy to quickly record and send these kinds of small changes at no charge. 4. Do whatever it takes to ensure your client’s satisfaction. This one seems like a no-brainer, but as evidenced by my conversation with the tree service owner, some people just don’t get it! It’s my mission to exceed my clients’ expectations! If I ever encountered a situation where a voiceover client was as upset with me as I was with the tree service owner, I would have offered to re-record their project at no cost. I even would be willing to refund part or all of the money if I could not meet the client expectations. I also would refer another voice talent in order to keep the client’s project on schedule. When your communications with your client overflow with respect, honesty, and integrity, you won’t even have to think about providing quality customer service — you will BE the definition of it! Very nice article, Karen. You took what could have been a negative and turned it into a positive and then shared it to help others. Now that’s great customer service! A great story…and many lessons to be learned here. This sort of thing happens all the time, unfortunately. Thanks for sharing. Karen, leave it to you to come up with something positive from such an obviously traumatic incident. My condolences regarding the trees. I would be heartbroken. Greetings, Donna, Martin, and Elaine! Thanks so much for your kind comments about this post and the commiseration about my trees. I do think things happen for a reason, and problems are opportunities to learn something in disguise. In addition to the customer service tips that I shared in this article, the situation with my trees was yet another vivid reminder to me to exercise patience and go with the flow when attempting to resolve a problem. The trees were cut a month ago, and amazingly, new leaves are sprouting! Thanks again for stopping by the blog! Amen Karen! If I get burned by a contractor or service provider, everyone AND their mother will learn about it, but If I encouter a service provider who exceeds my expectations, everyone and their mother’s NEIGHBORS will hear about it. We all want to be the hero. By turning someone on to great service, we reward those who helped us AND we become heroes to service seekers because we helped better insure their needs were met. My nightmare service story involved a plumbing contractor and their liberal definition of “replace side sewer hookup” but that’s a story for another day. I love your point that our being great service provider is both a reward to those who helped us and those we help. Thanks so much for dropping by the blog and leaving such a thought-provoking comment! Glad to hear the trees are starting to come around! Your article was a good analogy of our business, as well. I will never forget that term”topped out” as long as I live!